BAM (Battle Arena Melbourne) is a three day fighting game tournament aimed at being a major highlight in the Australian tournament season. Now in our sixth year we’re expecting to retain a strong attendance of 250+ and play host to fighters from all over Australia and indeed the surrounding area. 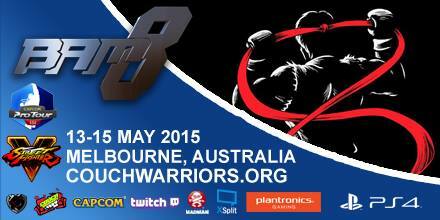 CouchWarriors is proudly partnering with New Game Plus TV as the BAM6 media and streaming partner. Look forward to many more exciting announcements on the event shortly.